We use UKMail, TNT and RoyalMail for the majority of our deliveries, to track your order, please enter your order number and click track. Enter the Order Number of the order you want to track. Tracking results should be available from 7pm on the despatch date. If you have any problems please email or give us a call weekdays between 9am and 5pm. We use UKMail, Royal Mail and TNT to deliver your orders. Deliveries to the UK and Ireland are handled by UKMail and Royal Mail, international deliveries are handled by UKMail, TNT and Royal Mail. * Deliveries to the Channel Islands will take an extra 2 days. Standard UKMail delivery costs for orders not placed via our website, going to United Kingdom (Main Land Excluding Highlands) are £8.95 (ex VAT) per box. For traders placing orders to be delivered direct to their customers we charge £12.00 (ex VAT) per box. Royal Mail International, TNT and UKMail charges are based on the weight of your order, before placing your order you can check the delivery costs, simply add all the products you wish to purchase to your shopping cart, select your delivery destination using the 'Destination' drop down menu, and the 'Despatch via' drop down menu should list the delivery costs for the different delivery methods. Some delivery methods are not available for all consignment weights and/or destinations, these will not be offered. Please note: Customs duties/taxes are the responsibility of the receiver, they vary greatly from country to country and we advise you get in contact with your local customs office for further information. Liability for carriage and additional charges due to non payment will be the responsibility of the purchaser. Should you need a personal quote for a large order email or give us a call weekdays between 9am and 5pm. Computer keyboards can be classified by the switch technology that they use. Mechanical keyboards have durable switches, one for each key. The choice of switch technology affects the sound, feel and travel of the key. The mechanical keyboards we sell mainly use either Cherry MX key switches, Matias key switches, Topre key switching or Unicomp (IBM) key switching. The Cherry MX key switch is a self contained key switch composed of a body, a spring, a stem and gold crosspoint contacts. The switch itself has a black body and the stem (the part that moves) comes in different colours depending on the switch type. The switch type is usually referred to by the colour of the stem. The Cherry brown switch often called tactile or ergonomic, travels 4mm, at 2mm there is a bump and past this the switch actuates. The switch needs 55cN of force to get over the bump. The Cherry blue switch often called click, travels 4mm, at 2mm there is a bump and past this the switch actuates with an audible click. The switch needs 60cN of force to get over the bump. The Cherry red switch often called soft linear, travels 4mm, at 2mm the switch actuates. The switch needs 45cN of force to actuate. The Cherry black switch often called linear, travels 4mm, at 2mm the switch actuates. The switch needs 60cN of force to actuate. The Matias switch is similar to the Alps mechanical key switch it is a self contained key switch composed of a body, a spring, a stem and contacts. The switch itself has a transparent body and a white, grey or red stem. The Matias Click Sactuateswitch travels 4mm, at 2mm there is a bump and past this the switch actuates with an audible click. The switch needs 60cN of force to get over the bump. The Matias Quiet Click switch travels 4mm, at 2mm there is a bump and past this the switch actuates. The switch needs 60cN of force to get over the bump and is one of the quietest mechanical switches. The Matias Quiet Linear switch travels 4mm, at 2mm the switch actuates. The switch needs 35cN of force to actuate and is one of the quietest mechanical switches. Topre capacitive key switching is based on the same technology as a smart phones screen, it consist of a stem in a housing over a rubber dome over a conical coiled spring over a printed circuit board. The switches are discrete components, but built as "sheets", and are available in different weights. We sell 45g and variable force Topre keyboards. In essence, the Topre switch feels first like a refined rubber dome and second in some ways reminiscent of some mechanical-contact switches such as the Cherry MX Red. The switch action is very smooth, with a tactile bump that you can feel near the top of the stroke. After the bump, the resistance is almost flat, and you can not feel the mid-stroke actuation point. Unicomp keyboards use buckling spring technology this refers to the fact that the coil spring tensed between the keycap and a pivoting hammer buckles, i.e. kinks or collapses, at a certain point as it's pressed down, providing auditory and tactile feedback to the keyboard operator. Upon buckling, the hammer is pivoted forward by the spring and strikes a membrane sheet which registers the key press. The buckling spring switch travels 4mm, at 2.3mm there is a tactile tap as the spring buckles and the switch actuates with a loud audible click. The switch needs 70cN of force to buckle the spring. Here is a glossary of mechanical keyboard terms. 60%: A style of keyboard which is about 60% the size of a full-size keyboard, by means of omitting the top function row, the navigation cluster and the numeric keypad. Access to the missing keys is typically achieved through a Function layer. The Filco Minila is an example of this style. ABS: a material used for keycaps, provided by default on most Cherry MX keyboards (including Filco and Max Keyboard) and also available as standalone keycap sets. ABS keycaps are generally lighter than their PBT counterparts. Actuation point: the point at which a key press is recognised by the keyboard. The amount of force required to reach this point is used as a measure of the switch’s stiffness. Alps: a mechanical switch that was once produced by a Japanese company of the same name. Today, the switch is out of production but has been adapted by companies like Matias into their own switch designs. ANSI: the standard physical keyboard layout for the United States and the Netherlands, among some other countries. Modern full-size ANSI keyboards generally have 104 keys, including wide Enter and left Shift keys. Buckling spring: a loud and heavy mechanical switch that uses a large spring that buckles at the actuation point, hence the name. Used by IBM in their Model M, and has since become rather rare. Modern equivalents are produced by Unicomp. Cherry MX: mechanical switches made by the Cherry Corporation, featuring a distinctive cross shape. Named by their colours (e.g. Cherry MX Red), each of which has a unique combination of weighting and feedback. For more, see our Mechanical Keyboards - Switches above or Intro to Cherry MX mechanical switches. Adapted by Kaihua into Kailh and Razer switches, among others. Cherry MX are the most popular mechanical switches worldwide. Click: a keyboard or switch that makes an audible “click” sound when pressed. Clicky switches often include a tactile bump as well (see Tactile). 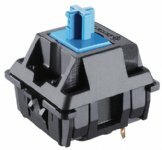 Examples of clicky switches include Cherry MX Blue and Matias Click. Debouncing: as a switch reaches its actuation point, it will bounce around a bit before it comes to rest. Debouncing is the act of correctly interpreting when a key is pressed, without reporting multiple actuations. This is largely a solved problem in modern keyboards. Full-size: A full-format keyboard, which includes a numeric keypad (for the opposite, see Tenkeyless). Also called by the number of keys included (e.g 105-key for a full-size British keyboard). The Filco Majestouch is an example of this style. Ghosting: an issue where pressing a combination of three or more keys results in the registering of an addition, unpressed key. Ghosting is prevented by manufacturers by blocking any keys which might be ghosts, but this limits the number of keys that can be pressed simultaneously. See Key Rollover. ISO: the standard physical keyboard layout for most of the world, with the notable exception of the United States and the Netherlands (see ANSI) and Japan (see JIS). British, German, Spanish, French and Nordic are all examples of ISO layouts, although each has a different logical layout (e.g. the first six letters are QWERTY in the UK and QWERTZ in Germany). Modern full-size ISO keyboards have 105 keys, including tall Enter keys and small left Shift keys. JIS: the standard physical keyboard layout for Japan (for western layouts, see ANSI and ISO). A modern full-size JIS keyboard has 109 keys, including additional keys to the left and right of the shortened space bar, in order to facilitate entry of characters from various Japanese alphabets. Key Rollover (#KRO): a limit to how many keys can be simultaneously pressed and correctly registered by the keyboard, often expressed. If you press more keys than your keyboard can register, some key inputs will be missed. Low numbers like 2KRO are typical of low-cost rubber dome keyboards, while 6KRO is the usual standard for a mechanical keyboard. Some keyboards are capable of more; other common figures are 10KRO and NKRO. Modifier keys (e.g. Shift, Ctrl, Alt, Win) do not count towards this limit. Linear: a keyboard or switch that lacks a tactile bump or click – instead, the resistance increases linearly as the key travels downwards. Examples of linear switches include Cherry MX Red and Cherry MX Black. Mechanical: a high-quality keyboard or switch that utilises a mechanism with a metal spring in order to register key presses. Many different switch designs fall into this category, including Cherry MX, Alps, Buckling Spring and sometimes Topre. N-Key Rollover (NKRO): a keyboard with NKRO can register as many keys simultaneously as you care to press down. See Key Rollover. PBT: a material used for keycaps, provided by default on most Topre and Unicomp keyboards and also available as standalone keycap sets. PBT keycaps tend to wear better and have a slightly more abrasive feel than their ABS counterparts. 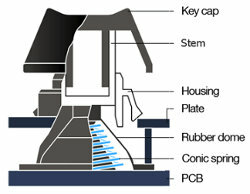 Rubber dome: a non-mechanical keyboard that uses a rubber dome to provide resistance and tacticality, mounted above a membrane sheet that registers the key press. Rubber domes are found in the vast majority of keyboards sold, thanks to their low cost. Tactile: a keyboard or switch that provides feedback you can feel, normally a “bump” or sudden increase in resistance that occurs as the key reaches its actuation point. Examples of tactile switches include Cherry MX Brown and Matias Quiet Click. Topre: electro-capacitive switches, consisting of a slider in a housing, above a rubber dome, above a coiled spring, above a circuit board. While the switch includes a rubber dome component, it is normally considered a mechanical switch rather than a rubber dome. Tenkeyless (TKL): A keyboard that does not include a numeric keypad, in order to minimise size and weight. These keyboards can allow for a more comfortable hand position and are more portable, a reasonable tradeoff if you do not often use the numeric keypad. The Filco Majestouch TKL is an example of this style. For the opposite of Tenkeyless, see Full-size. Travel: the distance that a switch moves from the top to the bottom of a key press. On an average laptop keyboard, key travel is noticeably lower than on the average desktop keyboard. Also available on our Blog. http://www.keyboardco.com is owned and operated by The Keyboard Company (UK) Ltd. The Keyboard Company is committed to protecting your privacy and will only use the information collected about you lawfully and in accordance with the Data Protection Act 1998. The information collected about you is used to process your order, you can sign up to receive information, offers and our news letter but this is an opt-in service only, and at any time you can opt-out. We use PayPal and SagePay for secure credit/debit card processing, when you 'check out' and enter your credit/debit card details you are already in an encrypted page, your details go directly for processing through a secure connection, they are not stored on our site and are not retrievable by us. Our website uses "cookie's" which are stored by your browser. You can usually modify your browser to prevent this happening if you prefer and cookies can be deleted at anytime by you. However if you block cookies you will not be able to add products to your shopping cart and 'check out'. All orders are accepted by The Keyboard Company subject to Conditions of Sale set out below. These terms and conditions shall be governed by and construed according to English Law. Although The Keyboard Company will endeavour to ensure the accuracy of all information made available on the web site, neither The Keyboard Company nor any directors, employees or other representatives will be liable for damages of any kind arising out of or in connection with the use of this site. Price and availability information is subject to change without notice. As manufacturers reserve the right to change specifications without notice, we must also reserve this right. All quotes of delivery dates given are approximate and we cannot be held liable for any loss or inconvenience caused as a result of delayed or non delivery. All goods remain the property of The Keyboard Company until paid for in full. Hardware items can be returned if we are notified within 14 days of receipt at the customers expense if in 'as new' condition, whereby a refund will be given. In the unlikely event of your goods being delivered faulty or damaged, you must contact us within a reasonable time of the date of delivery in order for us to arrange a replacement or provide a refund. We offer a 1 year 'return to base' warranty on hardware, this is not an insurance backed warranty. We endeavour to respond to complaints within five working days. By purchasing a product you are agreeing to the above terms and conditions. In the event that you should need to return anything to us, you will need an RMA (Return Merchandise Authorization) number to track your returned goods. To obtain an RMA number please click the 'Log a return' button. 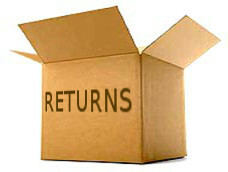 If you already have an RMA number and wish to track the status of your return click the 'track a return' button. All information given is stored securely and never passed on to third parties.